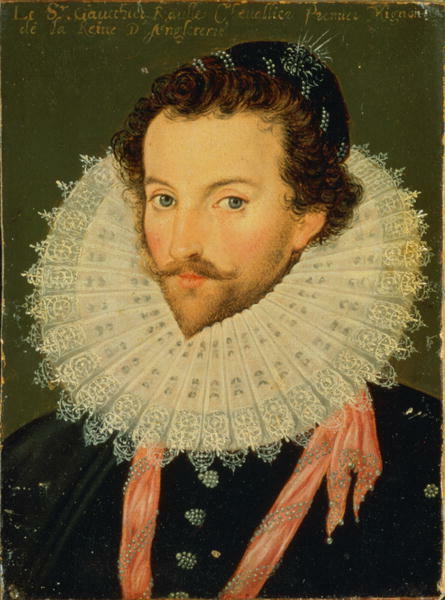 Walter Raleigh was born around 1554, although his exact date of birth is unknown. Raleigh grew up in a privileged home in Devon and was the youngest of 5 sons, 3 of which were half-brothers as they had a different father. Raleigh’s family were protestants and they had a number of close calls during the reign of Queen Mary 1st who was Roman Catholic. One of the closest, and most notable of these incidences was where Raleigh’s father had to hide in a tower in order to avoid execution. Raleigh served with the Huguenots during the French civil war and left Devon for France in 1569. Upon returning to the UK, Raleigh enrolled as an undergraduate at Oxford University, however he did not complete his course and left after only one year. The next few years of his life are not well recorded, but it is thought that he may have returned to France for a few years. In 1579 Raleigh went to Ireland. He led the British party at the Siege of Smerwick, and beheaded over 600 European soldiers. Following the rebellion in Ireland, Raleigh was awarded 40,000 acres of Irish land. As a result of this, he became one of the most important land owners in the Munster region. However, he struggled to find anyone willing to settle on the land. Raleigh came and went, staying in England and Ireland throughout the year. When he was in Ireland he lived in the town of Youghal, where he also served as Mayor. In 1584 Raleigh was granted a royal charter by Queen Elizabeth, and was knighted in 1585. With his new favour from the Queen he was able to explore and colonize land that was not already inhabited by Christian people, or owned by a Christian monarch. In return, the Queen asked that he give her 1/5th of any gold and silver that was mined in the area. He was given a 7-year timescale for this agreement. During the 7 years he went on a number of different expeditions. Importantly, Raleigh was instrumental in the English colonization of North America, and paved the way for future English settlements within Virginia. However, in 1591 he married Elizabeth Throckmorton without the permission of the Queen and as a result, when the queen found out, he and his new wife were imprisoned in the Tower of London. When he was released, they moved to Devon to retire. However, this was short lived as Raleigh heard of a new opportunity in South America and sailed to discover the ‘City of Gold’. Raleigh was sent to the Tower of London again soon after Queen Elizabeth died. This imprisonment was a result of him being involved in the Main Plot against King James I. Raleigh was released in 1616 and was sent to lead another expedition to South America. Raleigh returned to England after unsuccessfully completing the voyage. He was executed in 1618 in an attempt to appease the Spanish. In addition to being known as an explorer, Raleigh is also famed for being a writer, poet and a spy. He is also credited for popularizing tobacco use in England. As a result of all of his influences, he is now thought to be one of the most notable figures of the Elizabethan era.